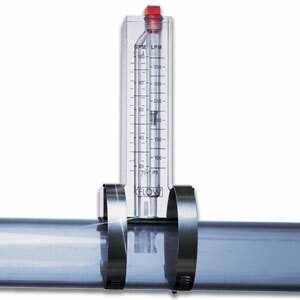 The water flowmeter of the FL-30000 Series use a pitot tube pickup and a hard-edged float design to provide a convenient and economical means of measuring water flow in a closed pipe system. A one-piece, impact-resistant machined acrylic body offers the strength and long service required in most commercial and industrial applications. Ten low flow rate models are ideal for applications where flowrates are typically low, such as in solar-heated pools and spas, electronics, and irrigation.